Over the last week Khalifa Haftar, general of the self-proclaimed, “Libyan National Army” launched a lightning assault towards Tripoli, leading to a counter mobilisation by the militias affiliated with the Government of National Accord (GNA), based in the nation’s besieged capital. The push was either motivated out his desire to take the national capital and become a second Gaddafi, or at least strengthen his hand in UN-sponsored talks with the rival Tripoli government. The events leading to the escalation of this conflict are convoluted and mercurial but can be traced back to 2011 and the nature and structure of Muammar Gaddafi's regime and its collapse. Second, Haftar’s rapid military campaign bears similarities to the Houthi’s lightening campaign to take the Yemeni capital Sanaa and later Aden, and comparisons with Yemen can offer insight to understand Libya’s present and potential future. Third, Haftar’s assault is emblematic of a greater trend in the Arab world of state frailty after the 2011 uprisings, and how armed non-state actors have become new agents driving politics in collapsed states. How did Libya reach its current crisis? Libya’s problems can be traced to Gaddafi's legacy of dictatorial rule and the nature of the uprising that overthrew him. The early stages of Libya’s uprising, which began on 18 February 2011 had strong sectarian and tribal overtones, not unlike what happened in Yemen. By early September 2011 the regime had fallen, only to face new problems. Just like Saddam Hussein’s regime in Iraq, Gaddafi created a personalised state, and when he was overthrown, the state collapsed with him. The movement to overthrow the Libyan leader never had a common leader to rally behind, nor a vision of what a post-Gaddafi Libya would look like. The centrifugal forces inherent in the nation’s tribal makeup and the new forces that were unleashed by the uprising soon started to jostle for power. Those anti-Gaddafi militias seized armouries, then facilities, such as airports, ports, refineries, to convert into political assets the day after. Soon the leaders of the militias sought to capture ministers or entire ministries and vied for foreign patrons. Libya’s new government did not have a strong national military, yet was unable to dissolve the militias. The militias were placed under the nominal control of the Ministry of Interior or Defense, which seemed to provide a governmental veneer of control, but in fact, merely subsidised the armed groups. 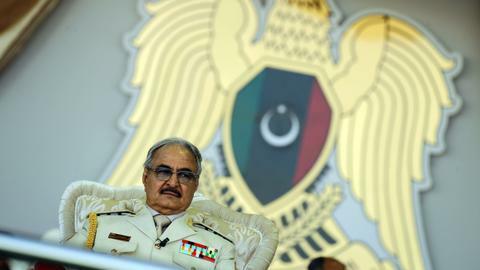 It was in this vacuum that Khalifa Haftar, himself a former Gaddafi-era military officer, was able to rise and formed the self-proclaimed “Libyan National Army.” In May 2014, he launched Operation Dignity in Benghazi, ostensibly to eject Ansar al Sharia, a Salafist militia that emerged during the 2011 uprising. The name of the operation soon became shorthand for the alliance he forged with a myriad of militias, which would later try to assert its authority in the capital Tripoli. The Dignity alliance of Haftar led to the emergence of a counter-mobilisation in Tripoli dubbed, “the Dawn Movement,” primarily comprising of 'Islamist' militias and the militia from the city of Misrata. To make matters worse, first, two rival governments emerged, one in Tripoli, and the other in eastern Libya, reliant on Haftar. Second, regional players used these alliances to serve as their own proxies. 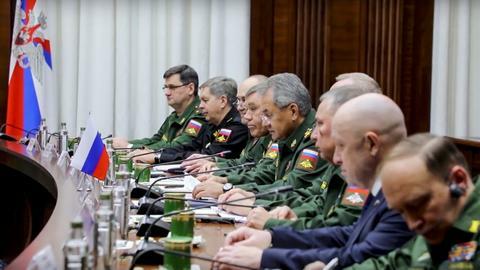 Egypt, the United Arab Emirates (UAE), and Russia and France to a lesser extent, backed the eastern government and Haftar’s forces, even deploying their air forces to support him, while Turkey and Qatar supported the government in Tripoli. As these outside patrons offered training, arms, and financial support, the militias had little incentive to end the conflict. The third problem compounding Libya’s crisis was as of 2015 divisions began to emerge within both militia alliances, leading to defections and shifting alliances. In response to this crisis, Western pressure tried to reconcile the two rival Libyan governments under a U.N.-sponsored plan to form a unity government, the Government of National Accord (GNA) in Tripoli. However, unity had proved elusive. The international community recognised the GNA in Tripoli, led by Fayez al Sarraj, was dependent on a network of militias for its defence, while a rival administration continued in the east allied to Haftar. While Libya appeared to have been divided into two, in reality, it had become a constellation of city-states, including Tripoli, Benghazi, Misrata, and Zintane, with a myriad of militias, tribes, and terrorists vying for control. Haftar had employed military force or developed patronage networks with the various parties to unite these fractured fiefdoms to strengthen his base. There are numerous differences between Yemen and Libya, in terms of history, geography, and demography. Second Libya’s oil resources and proximity to Europe invite greater French and Italian intervention. Yet both nations suffered from similar structural trajectories since 2011. Like in Libya, Yemen had witnessed the rise of militias, and just as there were military officers loyal to Gaddafi after 2011, so too there were officers loyal to deposed leader Ali Abdullah Saleh, both leaders who incidentally were eventually killed while trying to escape, in 2011 and 2017 respectively. Both Yemen and Libya attempted to form a unity government which fell apart. While Libya is divided by two governments, the internationally recognised one in Tripoli versus Benghazi, Yemen is divided between two governments in Sanaa and the internationally recognised one in Aden. The Houthis launched a lightning assault to reach the outskirts of Aden, setting up Yemen for a civil war and the LNA appears to be doing the same with its attack on the outskirts of Tripoli. Both conflicts have witnessed intervention by regional powers, primarily Saudi Arabia in Yemen, and the UAE is involved in both the Yemen and Libya conflicts. Finally, both conflicts and the ensuing instability have provided a space for Daesh to regroup and Al Qaeda to expand, whether it be Al Qaeda in the Islamic Maghreb (AQIM) or Al Qaeda in the Arabian Peninsula (AQAP). A comparison between Yemen and Libya demonstrates similarities, but the events there are also indicative of a systemic seismic shift in Middle East politics – the proliferation of non-state actors, militias. Instead of states with national armies fighting each other, which has primarily characterised conflict in the region since Israel was formed in 1948, what has emerged are new types of actors, quasi-states, with non-conventional militaries, combatting each other. Today you have Hezbollah versus numerous rebel and opposition groups in Syria; the Houthis versus the various remnants of the Yemeni army; Libya’s myriad of militias; or Iraqi militias that combatted ISIS (Daesh) point to a trend of oligopolies of violence, where large and bloated national militaries have either collapsed or exist in weakened form while being supplanted by militias fighting other militias. The problem with the proliferation of militias throughout the region is that they evolve into not just armed actors, but warlord economies, engaged in extortion and smuggling, making their dismantlement that much harder. Haftar’s success in many cases was due to locals in towns hoping the general would bring stability, which may now prove elusive. Regardless, the current fighting in Libya will only exacerbate the massive cost paid by Libyan civilians in terms of life, health, and property.